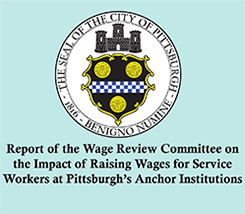 Last month, Region 6 of the National Labor Relations Board issued a 30-page complaint alleging over 80 violations of workers’ rights as part of an aggressive and hostile anti-union campaign waged against UPMC employees’ attempts to have a voice on the job and create middle class jobs. UPMC lawyers this month filed a motion with the National Labor Relations Board Region 6 to remove UPMC from the complaint as a single employer – UPMC claims it is only a holding company, it has no employees (only directors and officers), it has no operations, and it does not do business. After calling reports of anti-union activity by UPMC executives and managers a “complete fabrication”, it turns out UPMC wants us to believe its very existence is the fabrication. 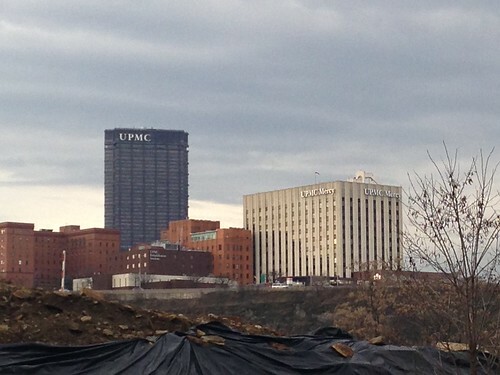 Did we all just imagine the 2.5 billion dollars of property in Allegheny County owned by UPMC? And the 55,000 people who work for UPMC? Not real. The colossal sign at the top of the US Steel tower – visible from nearly every part of the city? Just a figment of our collective imagination. Those millions of dollars of tax breaks for being a charity? Nope. Well, maybe it’s time to rethink public support of a business that doesn’t actually exist. 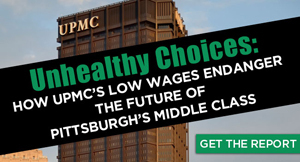 UPMC has made an art of ducking its responsibilities to our community – not contributing its fair share to public services, putting its profits and empire building above the health of our community and driving down wages for all workers by paying many of its employees poverty wages. Now, this absurd legal trick to avoid being held accountable for flaunting federal labor law. We’re not falling for it and we’re letting UPMC know it. If you see UPMC, take a picture and tweet with the hashtag #ISeeUPMC. If you’re not a tweeter, send your photos to ISeeUPMC@gmail.com with your name and general location.